For the longest time, I thought it was just me. I thought I was the only one who went into Target for laundry detergent and diapers, only to emerge an hour later with a cart full of bedding, clothes, food, and electronics. I kept my “secret” to myself for years before finally sharing it with my friends and learning that I wasn’t the only one. Many a woman (and some men) enters those red doors in a semi-hypnotic state, spending money on goodness-knows-what, and forgetting half the things that were on her list in the process. I’ve thought long and hard about why I have so little control over my spending when I go to Target. I don’t think there’s ever one reason – but I’ve learned the best way to save money is to avoid the store altogether. If I go to a regular grocery store for laundry detergent, I leave with laundry detergent, and nothing else. If you’ve got a new (or renewed) interest in controlling your spending this year, it’s high time you investigate your spending triggers. Once you understand them, you can put a plan in place to help you keep your money in your wallet, where it belongs. 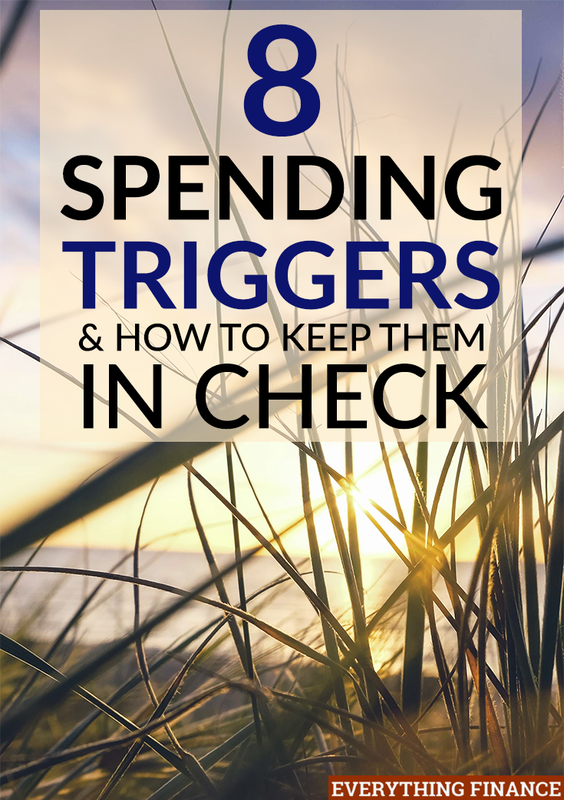 Here are 8 spending triggers and how to keep them in check. I’m queen of the “I’ve earned it” spending trigger. If I have had a bad day, I will treat myself to Starbucks. If I had a great day, I will treat myself to Starbucks. It doesn’t matter what has happened or what hasn’t happened, I will turn it into something that deserves a reward. Tip: If you must reward yourself, reward yourself with something that you have at your home (maybe leftover dessert). Bonus if you can reward yourself with something that’s free (like a nap). Everyone in your workplace has a Fitbit. Everyone carries a neat reusable water bottle. Everyone has a cool cell phone. Especially if you are new to the workplace, it’s natural to want to fit in. And fitting in doesn’t change much from high school to the workplace – you want to dress like everyone else and have the cool thing that they have. Perhaps you rush off to purchase the newest office trend every time. Tip: Challenge yourself to find someone else in the office who is not participating in the trend. Bonus if the person is high-ranking. I’ve fought against giving my oldest daughter dolls, because I knew how this would go. She would get a doll and then she would want a doll house. And then the doll house would need furniture. And the doll would need a car to drive to other doll houses. Then doll would need a dog to keep it company. Even as an adult, we are guilty of succumbing to the “add-on” attraction. Tip: Live by a budget. You might be able to buy the add-ons, but you’ll do it with a plan in place. I recently took a 12 hour flight for a business trip. My boss came with me, and she had pared all her belongings down into a carry on, despite the fact that the trip would be about a week long. I had purchased my luggage set years ago, and carry on rules have changes since then. I checked my very old bag and shrugged it off. I didn’t really want to run through airports with a heavy carry on in tow, anyway. Then I got back from the trip and started ogling brand new carry on luggage. In the back of my mind, new luggage was a requirement for my job. Tip: Reason with yourself; is this really required, or are you keeping up with the Joneses? If you truly think it’s required, at least ensure that it fits within your budget. We recently moved cross-country for my husband’s new job, so of course we needed to sell our home. As we were getting ready to list our house on the market I noticed that our bedding didn’t match the wall color. It honestly had never occurred to me before; we were using the same bedding we had before we’d bought the house and we had never repainted the master bedroom’s walls. With two small children, we weren’t going to get around to repainting anytime soon. Instead of painting, I did the next best thing. I went off to my beloved Target and shopped for a bedding set, throw pillows, and matching curtains to help stage the room. I convinced myself that I was saving us money in the long run. If I could stage the home well, it would sell quicker, and we would have to make fewer house payments on top of the rent in our new state. You know what happened? We moved across the country, with our brand new bedding packed in boxes, and the house sat empty for a few months. Then, it sold. The bedding and new curtains had nothing at all to do with it selling. I’m not totally knocking home-staging; I haven’t let you in on a secret. I was really in the mood for a new bedspread and I really wanted some cute throw pillows to go with it. I justified my expenses by saying that they’d save me money. Tip: If you are using the “I’ll save money” trick, challenge yourself to run the numbers. In the case of the bedding, my numbers probably would have said it was okay. However, the exercise might be enough to make you more mindful of your trigger. Chances are, if you are out with a group of friends, and one of them stops to buy something, you will consider following suit. Maybe your friend needed to get a cute new top for her big presentation next week, but did you really need to buy that dress? Sometimes this pressure comes in the form of expensive meals, activities, or even trips. These are your friends, they want to spend money on something, and they want you to join them. It can be hard to say no! Tip: If you are out shopping with your friends, try being happy for your friend’s purchase. Help pick out the top and take ownership of making her look great for her presentation. If your friends are constantly approaching you about expensive activities, try taking control of the situation by setting up an inexpensive, but fun, outing. Being an absentminded shopper is an easy spending trap to get caught in. It takes on many forms. Perhaps you stop into the mall to kill some time. Or maybe you knew you needed to run to the store, but you don’t have a list, so you wander around, hoping you’ll remember everything you need to get. Or maybe you had good intentions when you went shopping, but you brought your kids with you or talked on your cell phone the whole time. Controlling your spending while you shop means having a plan in place. Plans are hard to control if you wander aimlessly around stores, subjecting yourself to temptation. Plans are even harder to control when you bring distractions along with you. Tip: Shop with a list and minimize distractions. No, you can’t always leave the children at home, but at least shop when they are most likely to be in a good mood. Make sure they have a full belly and are well rested. It’s not uncommon to hear of parents who have bought their children something really extravagant out of guilt. Perhaps they missed a big game or recital or maybe they rarely get to see their child because of work commitments. In order to make it up to their child, they buy the newest gadget or the coolest clothes or the fastest car. Tip: If you are spending because of guilt, save yourself the money. Your loved ones love you because of you, not because of what you buy them. Sit down and write them a heartfelt message. It will be priceless to them. The truth of the matter is that everyone fits into each of these categories at some point in their lives. If one of the categories is causing you specific financial stress, by all means, brainstorm ways to put a stop to the trigger. However, don’t forget the other temptations that are lurking right around the corner! What are your biggest spending triggers? Have you found ways to combat them? Nice tip “Need to Keep Up with the Joneses”, but it is not all like that. Everybody need to fit in group, it is way to feel better, it is way to be socialized, and that is way to be promoted and earn more. Nobody want to be with weirdo.